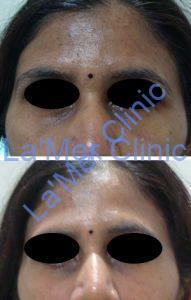 “Periorbital hyperpigmentation” or “dark circles under the eyes” is one of the main Aesthetic facial concerns now a days.. It occurs usually after puberty or in early adulthood (16-25 years). It is more pronounced in certain ethnic groups and is also frequently seen in multiple members of the same family. Patients, especially women are really bothered and concerned about it, even relating the presence of dark circles with significant impairment on their quality of life. Although not rare in males, females are affected more owing to the hormonal factors. Loss of subcutaneous fat, collagen fibres, elastic fibres which are responsible for keeping the skin taut. Treatments for these conditions vary with the cause. There are many other medical conditions which can mimic Under-eye Dark circles,for eg. Lichen planus pigmentosus, drug reaction, Atopic dermatitis, Drug reaction etc., which need to be addressed before starting the treatment . 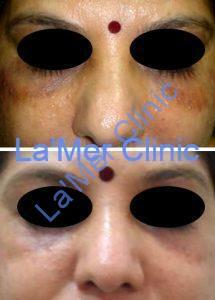 Dark circles due to laxity can be treated with under-eye fillers such as Ultraplus XC & Volbella.